The Cornerstones Curriculum is based on inspirational learning activities which take place in a classroom environment that allows children to learn in a way that motivates and interests them. Cornerstones will provide our children with a good level of challenge, giving them opportunities to solve problems, apply themselves creatively and express their knowledge and understanding across the curriculum. Every year group will experience a minimum of 4 Imaginative Learning Projects in a year. 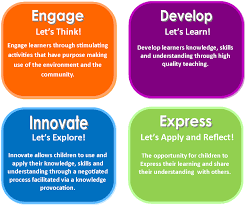 Each individual project is split into sections, which see children progress through four stages of learning: Engage, Develop, Innovate and Express.